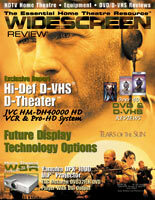 The technical levels of the articles are far beyond most other non-industry publications on home theatre. While I read many of them, WSR is very unique in its coverage, reviews, articles, and the added content of the Web edition. For all of those reasons, WSR is a must-subscribe for any HT enthusiast, and that is why I read it!